Figure 1: Before and after images of the sea floor showing a) Image of the sea floor mapped using satellite data, and b) image of the sea floor in the same location as figure 1a, however this image shows a strip of high resolution data (in colour) where multibeam data has been acquired. floor and return to the ship. 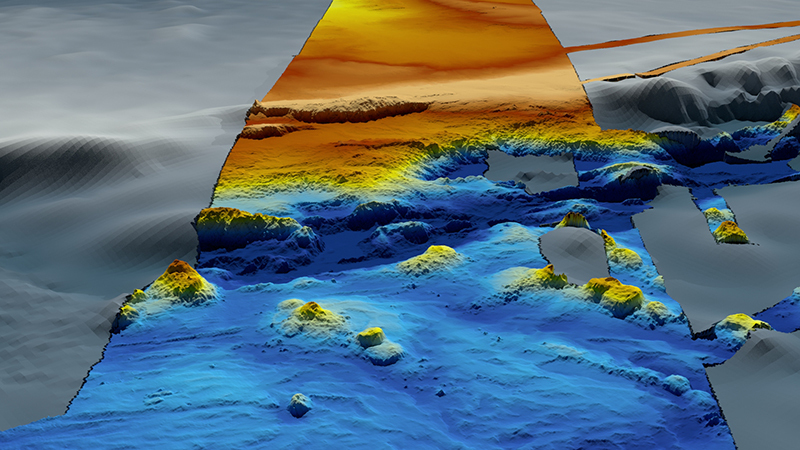 Geoscience Australia collects bathymetry data in multiple ways, mostly commonly using multibeam surveys. During a bathymetric survey, a multibeam sonar system is mounted on the hull of a survey vessel. 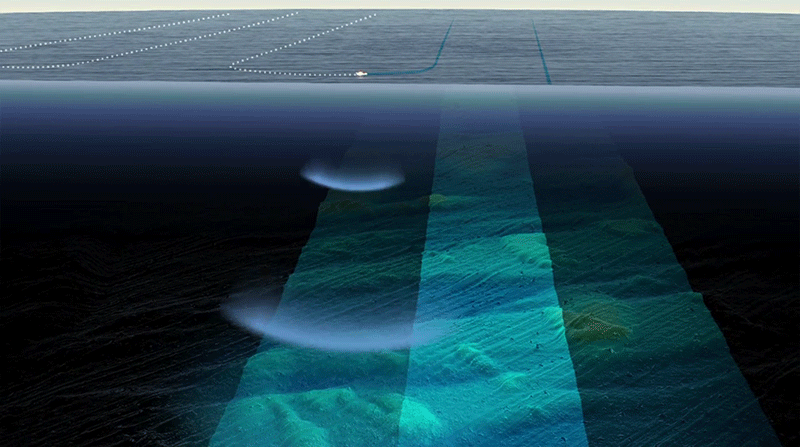 The sonar system sends out multiple soundwaves that bounce off the sea floor and return to the ship. The delay between sending and receiving the signal provides a measurement of ocean depth (Figure 2). These measurements are then used to produce a map charting the sea floor. Acquiring high resolution multibeam data is time-consuming because the survey vessel moves through the area in overlapping lines to capture the data in a systematic way (Figure 3). Overlapping the lines increases confidence in the data’s accuracy and helps address any gaps in the data caused by factors such as bad weather. to ensure all areas are covered. Different frequencies are used to map different water depths. Overall, the higher the frequency, the better the resolution of data produced, because the high frequency soundwaves will reach the seafloor at more of an angle, creating better return signal. However, high frequency waves dissipate faster and as such, in deep water, they may dissipate before reaching the seafloor. As a result, higher frequencies (greater than 100 kHz) are used for shallow water and low frequencies (less than 30 kHz) are used for deeper water. A low frequency system is required in deep water so that the soundwaves can reach the sea floor. The deeper the water, the greater the area the beam covers. 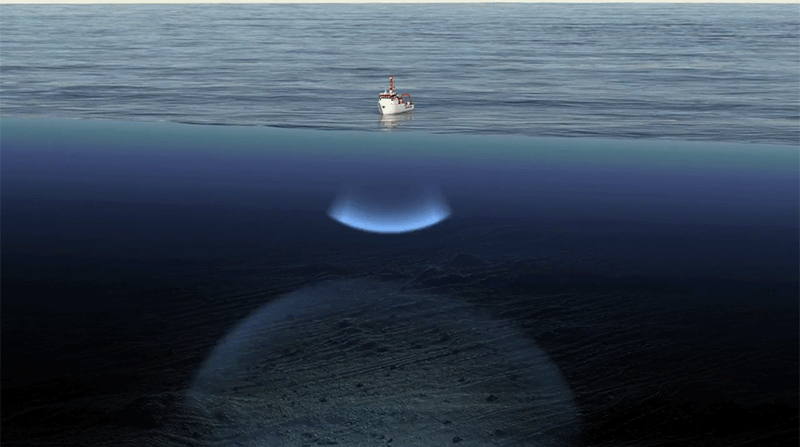 The fan-like shape of the sonar wave spreads out through the water column until it reaches the sea floor (see figure 2). As the water gets deeper, the more the fan spreads out, and the more area is covered by the beam. To increase the resolution of the data collected in deep water, the fan can be narrowed to collect data of a smaller area; this increases the resolution but it is more time-consuming as many more lines of data will need to be acquired. When processing multibeam bathymetry data, corrections need to be made to allow for factors such as water salinity, sea temperature and ocean depth; as these factors affect how quickly sonar signals travel through the water. The Australian Bathymetry and Topography Grid, (June 2009). This compilation of different bathymetric datasets merged into a seamless grid has a spatial resolution of 250m. Geoscience Australia also produces a range of other products that use bathymetric data, including geomorphology and seabed hardness. The Australian Hydrographic Office retains a copy of every bathymetric survey acquired in Australian waters to be used for charting and navigation purposes. 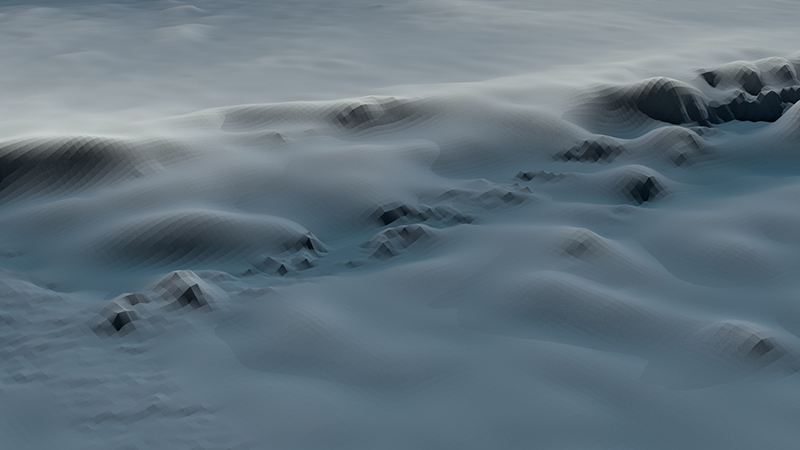 Geoscience Australia produces 3D animations and other visualisation products, allowing viewers to ‘fly through’ the sea floor terrain.